As you can read above, the sampler was "Wrought by Hannah Buxton [in] 1827". Hannah was the daughter of John Buxton (1783-1816) and Mary (Osborn) Buxton (b. 1785), who married February 28, 1809. Hannah gave her own date of birth, October 24, 1812, as well as the birth dates of her sisters Eunice and Alice. A record in the data base New Hampshire Marriages, 1720-1920 and viewable on FamilySearch.org, with no image attached, notes that Joseph Buxton and Mary Osborne married on February 28, 1810 at Weare, New Hampshire. According to this record, Joseph was born at Henniker, New Hampshire, the son of David and Ruth Buxton; and Mary Osborne was born at Weare, New Hampshire, to Moses Osborne and Ruth (Paige) Osborne. 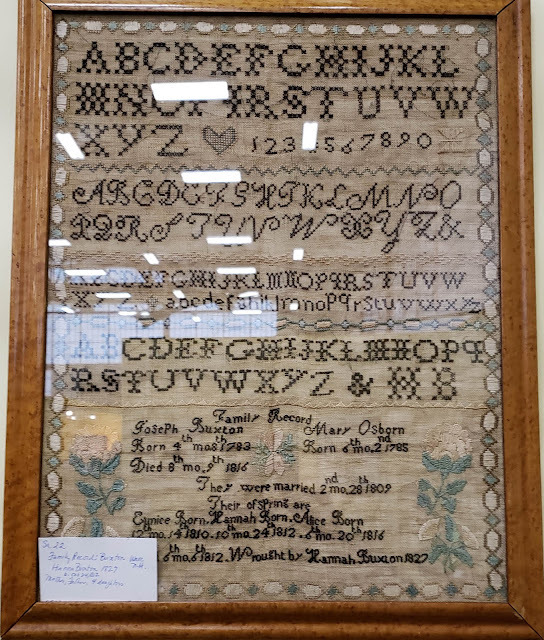 If you have knowledge of the Buxton and Osborn(e) families of New Hampshire, please leave a comment or contact me directly. 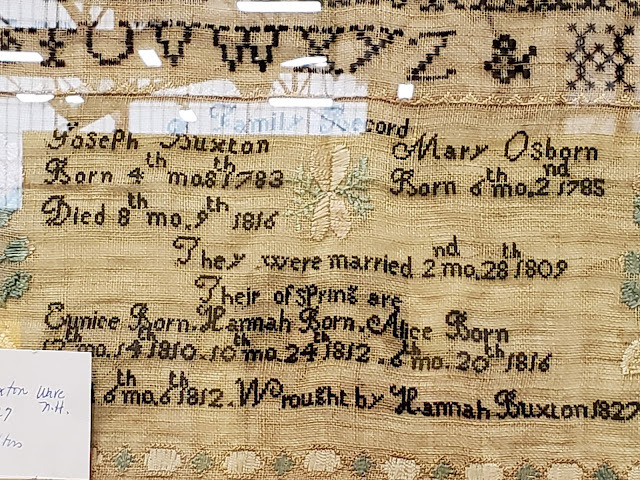 Hope you can get back far enough in your Osborn roots to a common ancestor with Mary (Osborn) Buxton!